The activity of the ribonucleoprotein enzyme telomerase is detectable in germ, stem and tumor cells. One major component of telomerase is human telomerase reverse transcriptase (hTERT), which encodes the catalytic subunit of telomerase. Here we investigate the correlation of telomerase activity and hTERT gene expression and the differentiation status of primary testicular germ cell tumors (TGCT). Telomerase activity (TA) was detected by a quantitative telomerase PCR ELISA, and hTERT mRNA expression was quantified by online RT-PCR in 42 primary testicular germ cell tumors. The control group consisted of benign testicular biopsies from infertile patients. High levels of telomerase activity and hTERT expression were detected in all examined undifferentiated TGCTs and in the benign testicular tissue specimens with germ cell content. In contrast, differentiated teratomas and testicular control tissue without germ cells (Sertoli-cell-only syndrome) showed no telomerase activity and only minimal hTERT expression. These findings demonstrate an inverse relationship between the level of telomerase activity and hTERT mRNA expression and the differentiation state of germ cell tumors. Quantification of telomerase activity and hTERT mRNA expression enables a new molecular-diagnostic subclassification of germ cell tumors that describes their proliferation potential and differentiation status. Testicular germ cell tumors (TGCT) are the most frequent malignant disease in young men . The current parameters for treatment stratification enable stage-related therapy only to a limited degree . This study evaluates the suitability of telomerase activity and the gene encoding the catalytic subunit of telomerase (human telomerase reverse transcriptase, hTERT) as a potential diagnostic marker for evaluating the differentiation status of testicular germ cell tumors. Telomerase functions as an intracellular reverse transcriptase that catalyzes the synthesis and extension of telomeres . Telomeres, the distal ends of linear eukaryotic chromosomes, are composed of hexanucleotide repeats (TTAGGG)n. They protect the encoding DNA sequences from damage and destabilization by binding various proteins. Most human somatic cells lose telomeric repeat sequences with each cell division, which leads to replicative senescence [4, 5]. In contrast, germline, stem, and most tumor cells are believed to be immortal because telomere length is maintained by the enzyme telomerase . One major component of the active enzyme is the catalytic subunit human telomerase reverse transcriptase (hTERT) [7–10]. hTERT mRNA is expressed almost exclusively in malignant tumors as well as in stem and germ cells and correlates closely with the detection of telomerase activity [7–10]. Ectopic hTERT expression in combination with two oncogenes (SV40 large-T and H-ras) has been shown to cause tumorigenic conversion of normal human epithelial and fibroblast cells in experimental settings . Thus the telomerase catalytic subunit appears to play a central role in human carcinogenesis. Telomerase detection was used to differentiate between benign and malignant tissue in a large number of tumors . Telomerase activity [12–16] and hTERT mRNA [16–18] were identified as potential prognostic markers in some tumor entities. Though telomerase detection correlates with malignancy in the majority of cancers, this is not the case in testicular germ cell tumors, since germ cells possess high intrinsic telomerase activity. The latter might actually provide the basis for the development of testicular germ cell tumors, which are histogenetically derived from germline cells [20, 21]. Here, an important prerequisite for the growth of cancer cells, i.e. immortalization by reactivation of telomerase, already exists and thus accelerates carcinogenesis. The presence or absence of telomerase activity appears to be unrelated to telomere length in testicular germ cell tumors . In addition, an inverse correlation was found between telomerase activity and tumor differentiation . Moreover, an association has been reported between increasing tumor differentiation and downregulation of human telomerase RNA expression . We previously corroborated these findings in a limited set of human GCT specimens and human testicular tumor cell lines by demonstrating that telomerase activity is high in seminomas and nonseminomas but low in differentiated teratomas and cells submitted to cisplatin treatment . In this study, histologic findings in primary adult human testicular germ cell tumors were correlated with levels of telomerase activity and hTERT mRNA expression, which were quantified by a quantitative PCR ELISA and real-time fluorescence RT PCR respectively. Primary testicular germ cell tumors were obtained from 42 patients at the time of primary orchiectomy. The examination was done in tissue samples with predominant components (>80 %) of the individual tumor entities (e.g., embryonal carcinoma, immature teratoma, etc.). In 7 of the 42 cases, samples were also examined from adjacent intratubular germ cell neoplasia of the unclassified type (ITGCNU) (synonym: carcinoma in situ, CIS, testicular intraepithelial neoplasia  with a tubular component >30%. The control group comprised testicular tissue samples from 38 patients with infertility. All specimens were collected from 1997 to 2000 at the Departments of Anatomy and Andrology, the University Hospital Hamburg Eppendorf and at the Department of Urology, the University Hospital Benjamin Franklin, Berlin. The use of the tissue specimens was approved by the Institutional Review Boards. Tissue samples were divided after removal. One part was snap-frozen, and the other part was histologically analyzed. This procedure enabled direct correlation of the histopathological and molecular parameters. All snap-frozen tissue specimens were serially sectioned. The first and last five sections were cut into 5 μm slices and stained with hematoxylin-eosin to assess tissue preservation and check the histopathological classification. This procedure ensured the examination of tissue samples with predominant components of the respective tumors (>80%). The formalin-fixed and paraffin-embedded tumors were assessed according to the WHO classification . Hematoxylin-eosin staining was supplemented by immunohistochemistry, including placental alkaline phosphatase (PLAP) and CD31/factor-VIII as well as monoclonal antigen Ki-67 for some tissue specimens and cytokeratin-20 for seminomas. Biopsy material of the control group was fixed in Stieve solution, stained with hematoxylin-eosin and PLAP and histologically evaluated according to a modified Johnsen Score . Tissue for RNA and protein extraction was obtained from 15 μm intermediate sections. Total RNA was extracted using the RNAzolB™ extraction kit (WAK-Chemie Medical, Bad Homburg, Germany) according to the manufacturer's instructions, and its quality was assessed as previously described . In brief, the RNA yield was quantified by UV spectrophotometry, and one microgram of total RNA was subjected to 1% agarose gel electrophoresis. Preservation of 28S and 18S rRNA species was used to assess RNA integrity. Samples without detection of 28S/18S RNA were excluded from further examination. As already described previously , the tissue specimens obtained by orchiectomy were prepared for the detection of telomerase activity as follows. First the tissue samples were lysed using 200 μl of lysis buffer (10 mM tris-HCl [pH7.5], 1 mM MgCl2, 1 mM EGTA, 0.1 mM phenylmethylsufonyl fluoride, 5 mM β-mercaptoethanol, 0.5% 3 - [(3 - chloroamino - dopropyl) dimethylamino] - 1 propanesulfate (CHAPS), 10% glycerol) according to the method of Kim et al. . After 30 min of incubation on ice, the lysate was centrifuged at 14,000 × g for 30 min at 4°C. The supernatant was aliquoted, flash-frozen in liquid nitrogen and stored at -80°C. The protein concentration of the extract was measured by the biuret method. A quantitative telomerase PCR ELISA kit (TeloTAGGG Telomerase PCR ELISA (PLUS), Roche Molecular Biochemicals, Mannheim, Germany) was used according to the manufacturer's instructions to detect PCR products employing biotin-labeled TS primer as previously described [30, 31]. The assay is essentially the same as the one described by Kim et al. , but, instead of radioactive nucleotide labeling, biotinylated primers were used during the extension reaction, thus enabling quantitative photometric detection by a streptavidin-DIG-peroxidase immunoreaction. Quantitative detection of hTERT mRNA was performed with the commercially available LightCycler Telo TAGGG hTERT Quantification Kit® (Rouche Diagnostics GmbH, Mannheim, Germany) using the LightCycler® instrument (Roche Molecular Systems, Alameda, CA) for real-time PCR. All subsequent quantification steps were performed according to the manufacturer's instructions. 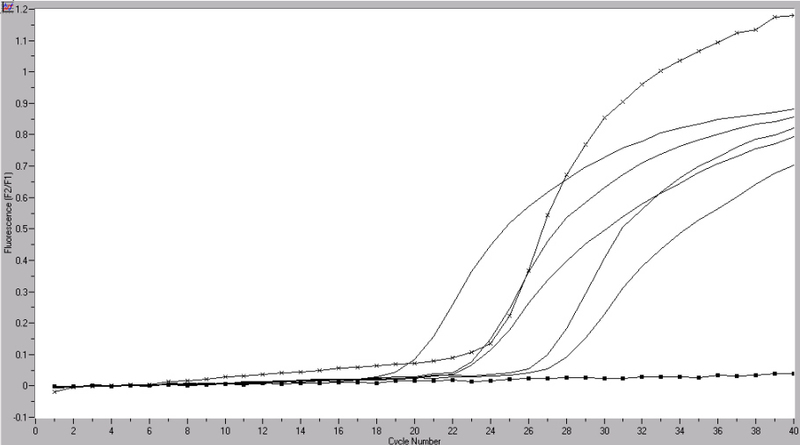 The recently introduced LightCycler® is a thermocycler with on-line monitoring of PCR products. The amplicon is detected by fluorescence using two short oligonucleotides that hybridize to an internal sequence of the amplified fragment during the annealing phase of the PCR cycles. One probe is labeled with a fluorescent dye at the 5' end, the other with fluorescein at the 3' end. The probes are designed to hybridize to the target strand so that the two dyes are in close proximity and fluorescence resonance energy transfer takes place between the two fluorophores. This leads to the emission of fluorescence, which is detected on-line during the PCR cycles. Briefly, hTERT encoding mRNA was reverse-transcribed (10 min at 60°C), followed by denaturation of the RNA/DNA complex (30 sec at 95°C) and amplification of a 198 bp fragment of the generated cDNA in 40 PCR cycles (0.5 sec at 95°C; 10 sec at 60°C; 10 sec at 72°C) with specific primers in a one-step RT-PCR reaction. The following were prepared for each PCR assay: 2 μl of hTERT reaction mix, 0.1 μl of reverse transcriptase, 2 μl of hTERT or PBGD detection mix, 13.9 μl of H20 and 2 μl of standard RNA template (1–5) / 100 ng/1 μl of total RNA from an hTERT-positive cell line / H20 or sample RNA. The same RT-PCR for mRNA encoding the housekeeping gene for porphobilinogen deaminase (PBGD) was performed in separate tubes. The reaction product served as a control for RT-PCR and as a reference for relative quantification of hTERT mRNA and hTR. To provide a positive control and establish an external standard curve, all measurements included the determination of 5 standards with in-vitro-transcribed hTERT mRNA containing 1.3 × 106, 9.8 × 104, 8.0 × 103, 7.2 × 102 and 1.4 × 102 copies/2 μl as well as total RNA purified from an hTERT mRNA-expressing cell line supplied by the detection kit. The graph of the linear regression and calculation of the regression coefficient r served to confirm the accuracy and reproducibility of this approach. Total RNA was used as a positive control for detection of PBGD mRNA. Probes without template that otherwise fulfilled the same requirements were examined as negative controls. Each sample was normalized on the basis of its PBGD content according to the formula NhTERT = hTERT mRNA copies per sample / (PBGD mRNA copies per sample / 1000). Probes were evaluated as hTERT mRNA-positive when the measurement of standard probes and controls yielded adequate results and > 400 copies of PBGD mRNA were detected, suggesting an appropriate initial quantity and quality of total RNA. They were assessed as negative when no hTERT mRNA was detected in the presence of > 400 copies of PBGD mRNA. Statistical analysis was performed using the Kruskal-Wallis test for nonparametric analysis of variance to compare the histological subgroups. The correlation of NhTERT and telomerase activity was evaluated by using the Spearman's test. A discriminant analysis of NhTERT and telomerase activity was also performed for the different histological subgroups. Values were expressed as follows: mean, standard deviation, median, 25th percentile, 75th percentile and range. The SPSS Software Version 10.0 was employed for all calculations,. Table 1 provides clinical data on the tumor samples, while Table 2 shows the histological classification of the tissue specimens. ITGCNU (>30%) = intratubular germ cell neoplasia, unclassified in more than 30 % of the tubuli. TGCT = Testicular germ cell tumor, *Clinical stage according to the UICC classification . Expression of telomerase activity (TA) and hTERT mRNA in primary testicular GCT hTERT transcripts and TA were detected in 34 / 42 of TGCT as well as in all (n = 7 / 7) ITGNU (mean N hTERT = 43.1 ± 24.1 standard deviation, range 0.00–99, mean TA 0.34 ± 24.1 range 0.00–0.74). Correlating the histopathology with hTERT mRNA expression and telomerase activity (TA) revealed significant differences between mature teratomas and other germ cell tumors (Kruskal-Wallis test, p < 0.001) (see Table 2, Fig. 1 and Fig. 2). The Kruskal-Wallis test showed no statistically significant differences in telomerase activity and hTERT expression within the group of undifferentiated seminomatous and nonseminomatous germ cell tumors. Quantification of hTERT mRNA (■) in germ cell tumor samples by real-time RT PCR. Quantification of PBGD mRNA (x) served as a reference for relative quantification. The copy numbers of the starting template were calculated by comparing the relative fluorescence signals of samples to external hTERT mRNA standards. 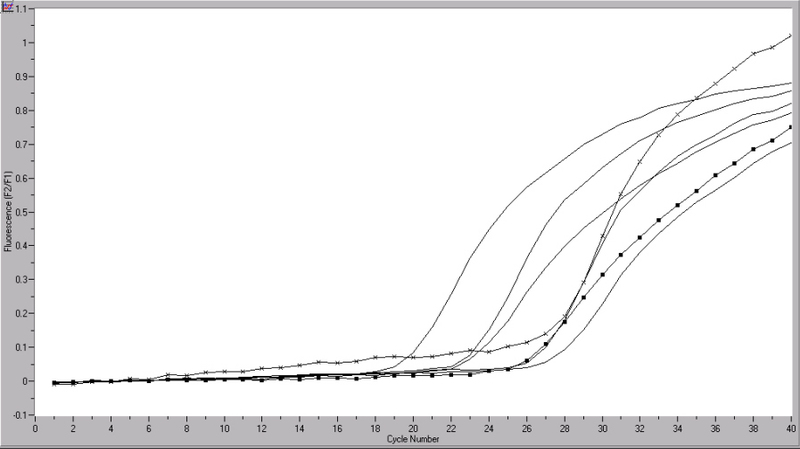 X axis: cycle number, Y axis: fluorescence emission; Tissue specimen with NhTERT = 85,2 copies. Quantification of hTERT mRNA (■) in germ cell tumor samples by real-time RT PCR. Quantification of PBGD mRNA (x) served as a reference for relative quantification. The copy numbers of the starting template were calculated by comparing the relative fluorescence signals of samples to external hTERT mRNA standards. X axis: cycle number, Y axis: fluorescence emission; tissue specimen with NhTERT = 2,1 copies. Analysis disclosed little or no telomerase activity or hTERT gene expression in any of the pure mature teratomas examined (Kruskal-Wallis test, p < 0.001). Embryonal carcinomas had the highest hTERT mRNA expression and TA (mean N hTERT = 75.8 (± 14.5), TA 0.55 (± 0.16)). Embryonal-like somatically differentiated immature teratomas evidenced a mean hTERT mRNA expression of N hTERT = 54.3 (± 12.4) (TA 0.39 (± 0.12). TGCTs showing extraembryonal differentiation such as yolk sac tumors (mean N hTERT = 37.3 (± 12)) (TA 0.39 (± 0.15) and choriocarcinomas had a lower mean hTERT mRNA expression (N hTERT = 37.6 (± 6.7)) and TA (mean TA 0.42 (± 7.9)) than embryonal carcinomas. Pure seminomas had a mean hTERT copy number of N hTERT = 41.2 (± 11.6), which was markedly below that of EC (mean N hTERT = 75.8 (± 14.5)). The hTERT mRNA expression level in ITGNU (ITGNU component > 30% of the tubules) was similar to that in seminomas (mean N hTERT 46.2 (± 21.3)) and decreased as the percentage of the ITGNU component increased. Thus, this inverse correlation of the ITGNU component and the N hTERT copy number could be explained by an increasing presence of germline cells and subsequent hTERT expression associated with a decreasing ITGNU component in testicular tissue specimens. In contrast, mature teratomas, which are tumors histologically characterized by well-differentiated tissue components of all 3 germ layers , showed a nearly complete downregulation of hTERT gene expression (mean N hTERT = 3.2 (± 3.1)) and a lack of telomerase activity (mean TA 0.03 ± 0.06). The histopathological diagnosis of 4 teratomas as mature types had to be revised because they unexpectedly expressed hTERT mRNA and telomerase activity and the histopathological reexamination did reveal areas with yolk sac tumor (in two cases), yolk sac tumor / embryonal carcinoma (one case) immature cartilage (one case). Telomerase activity and hTERT mRNA expression were found to correlate with germ cell differentiation. Expression of hTERT mRNA (N hTERT = 132.0 (± 48.0)) proved to be highest in tissue samples with normal gametogenesis but was significantly reduced in those with maturation arrest at the spermatocyte I° and II° level (N hTERT = 53.0 (± 17.3)) and at the level of spermatogonia (N hTERT = 23.2 (± 7.8)), as described previously . In patients with germ cell aplasia, hTERT mRNA expression was absent in 6 of 8 cases and only minimal in two with marked granulocytic infiltration (N hTERT = 7.2 and 4.1), indicating that, hTERT expression is germ-cell-specific in benign testicular tissue. (Table 3 gives a summary of hTERT mRNA and telomerase activity expression in benign testicular tissue). hTERT = human telomerase reverse transcriptase. MA = maturation arrest (Johnsen score 3–5); Norm = normal gametogenesis; SCOS = Sertoli-cell-only syndrome. The Kruskal-Wallis test showed significant differences between NhTERT copies expressed by mature teratomas and other subgroups of nonseminomas and seminomas (p < 0.001). Discriminant analysis disclosed a 97% (94.5%) accuracy of NhTERT (telomerase activity) for classification of germ cell tumors in the group of mature teratomas versus the other subgroups. The detection technique had a specificity of 96% (94.2 %) and a sensitivity of 100% (100%) with a selected cutoff value of NhTERT = 15 (telomerase activity 10 units) for differentiating mature teratomas from the other subgroups. In the control group, discriminant analysis showed that detection of hTERT (or TA) had a high predictive value (86.8%) (predictive value for TA 58%) for correct classification in one of the three benign histological subgroups. This study is the first to report levels of telomerase activity and hTERT mRNA expression in adult male GCT by using real-time PCR. We quantified telomerase activity (TA) in these samples by a semiquantitative PCR ELISA to enable comparative studies with hTERT levels. Though TA is thought to play an important role in the development of most cancers , its detection in testicular tissue specimens is not specific for malignant disease [6, 19]. TA is also found in benign testicular tissue. There, it can be attributed to germline cells  and is downregulated during spermatogenesis [19, 36, 37]. Unlike the majority of malignant tumors, TGCT arise from primarily telomerase-positive cells . According to a widely accepted theory postulated by Skakkebaek, all adult TGCTs except for spermatocytic seminomas are attributable to carcinoma in situ . TGCTs can be subdivided into two main types: seminomas (SE) and nonseminomas (NSE) . Seminomas retain the morphology of gonocytes. NSE-TGCTs display embryonal and extraembryonal differentiation patterns, including primitive zygotic (embryonal carcinoma), embryonal-like somatic (teratoma), and extraembryonal differentiation (choriocarcinoma, yolk-sac tumor). Of all tumors with differentiated elements, differentiated (mature) teratomas exhibit the most complete differentiation, often containing cell types such as those composing cartilage and neural tissue . The N hTERT gene expression and TA quantified in malignant TGCT underlines the above-mentioned prevailing concepts on the histogenesis of germ cell tumors. While embryonal carcinomas were found to have the highest mean hTERT mRNA and TA levels, downregulation of hTERT mRNA expression and TA was seen with increasing embryonal-like somatic tumor differentiation. 1) A downregulation of hTERT and telomerase activity in the course of tumor cell differentiation. 2) Tissue-specific factors of the individual tumors such as necrotic areas in choriocarcinomas or extensive stromal components in yolk sac tumors. Mature teratomas showed virtually no hTERT mRNA expression or TA (Table 2). Interestingly, the loss of hTERT gene expression and TA in mature teratomas correlated with the limited proliferation capacity and chemotherapy resistance of these tumors, which, unlike all other TGCTs, are insensitive to chemotherapy . The fact that the histopathological control examination revealed areas with yolk sac tumor (in two cases), yolk sac tumor / embryonal carcinoma (one case) immature cartilage (one case) in four teratomas which unexpectedly expressed hTERT and showed TA after being histologically classified as the mature type points to the possibility of using hTERT mRNA and TA detection for molecular-biological validation/confirmation of a histopathologically diagnosed mature teratoma. Among TGCT showing extraembryonal differentiation, both yolk sac tumors and choriocarcinomas with a clinically poor prognosis  had a lower mean N hTERT expression and TA than embryonal carcinomas and seminomas. This suggests that the level of hTERT mRNA expression and TA in TGCT correlates with the differentiation status of the tumors . Benign testicular tissue showed a close correlation between impaired gametogenesis and downregulation of hTERT gene expression and TA. Expression was highest in testicular tissue specimens with normal gametogenesis and downregulated in those with maturation arrest. It remains unclear whether the downregulation of hTERT gene expression which we observed is causally associated with the impairment of germ cell differentiation, as has been demonstrated for mice genetically deficient in murine telomerase RNA [41, 42] or whether there is no correlation. In conclusion, our data indicate that TA and hTERT mRNA expression were detectable in all undifferentiated TGCTs. Mature teratomas were the only germ cell tumors that showed no hTERT expression or TA. This suggests an inverse correlation between the differentiation status and hTERT mRNA expression in TGCT. Thus, detection of hTERT mRNA expression and TA in tumors histopathologically classified as differentiated teratomas enables a molecular-diagnostic confirmation of this tumor subtype. Since the differentiation status of GCTs correlates with their clinical behavior, as demonstrated for the less differentiated EC, the quantitative detection of hTERT mRNA copies and TA could provide molecular augmentation of the histopathological diagnosis. However, prospective clinical studies are required to substantiate these findings. The authors wish to thank Ms. Angelika Schneller, Ms. Petra von Kwiatkowski and Ms. Antonia Maas from the Department of Urology for their excellent technical support in assessing the samples. They are also grateful to Tim Chrismas, MD, for providing some of the retroperitoneal tissues, Thomas Emrich, M.D. (Roche Diagnostic, Penzberg, Germany) for technical assistance with the LightCycler® and to Werner Hopfenmüller, M.D., Ph.D. (Department of Medical Statistics) for help in performing the statistical analysis.